Dustin Eglseder was born in Guttenberg, Iowa on April 18, 1985 to John and Rose Eglseder. His sister Amy Jo was four years old then. Dustin attended Guttenberg Elementary School and later Clayton Ridge High School. Dustin was actively involved in high school sports, including football, baseball, soccer, and basketball. He also sang in the school choir. Dustin’s two passions in life were signing and the Chicago Cubs. After graduation, Dustin moved to Cedar Rapids, Iowa and attended Kirkwood Community College while working for RuffaloCODY. After finishing at Kirkwood Community College he transferred to Mt. Mercy College. Early mornings in the fall he often spent with his buddies duck hunting or tail gaiting before the Iowa Hawkeye football games. On the weekends during the summer he would be back in Guttenberg on the river with his buddies and a cooler full of Busch Light. He also enjoyed supporting his cousin Jordan and the UNI Basketball team. Some of Dustin’s other favorites included: his Chevy Silverado, The Office and King of Queens, pistachios, tomatoes, and his mother’s tuna noodle casserole. Dustin was most well-known for his smile and sense of humor. On March 1, 2007, Dustin was diagnosed with osteosarcoma of his right humerus (upper arm), with some lymph node involvement. He began his first round of chemotherapy at the University of Iowa hospital shortly thereafter. In May of 2007, his friends and family hosted a fundraiser benefit to help raise money to pay for his medical expenses; over 750 people attended to show their support. Later that month, after 4 rounds of grueling chemo treatments, they performed a limb salvaging surgery on his arm. Dustin spent much of the summer and early fall of 2007 receiving chemo treatments, watching the Chicago Cubs on television at the University of Iowa hospital. It was at that time he learned of a contest that the Chicago Cubs were holding. The winner of this contest would become the first ever “regular” fan to sing “Take Me Out to the Ball Game” during the 7th Inning Stretch at Wrigley Field. Dustin entered the contest, along with thousands of other fans. Between chemo treatments, he had the opportunity to audition in front of a number of Cubs legends and ultimately made the cut from thousands, to the top 50, then to the top 10. The following is a quote attributed to Winston Churchill that best describes this experience and the affect it had on Dustin: “There comes a special moment in everyone’s life, a moment for which that person was born. That special opportunity, when he seizes it, will fulfill his mission – a mission for which he is uniquely qualified. In that moment, he finds greatness. 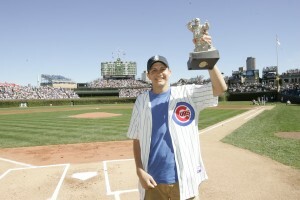 It is his finest hour.” On September 22, Dustin won the hearts of Cubs fans across the nation, when he won the contest! According to legendary Cubs announcers, Dustin gave one of the best performances of the song they had ever seen. The following day he was flown to New York for an appearance and an encore performance on Good Morning America. Soon after this experience, Dustin’s chemo treatments were complete, and we all thought we had our happy ending. Unfortunately, only a few weeks later, he began to have pain again. At that time an MRI showed that the cancer had metastisized to his shoulder and supraclavicular regions. Dustin and his family sought out a second opinion provided by the Mayo Clinic in Rochester, Minnesota. In November of 2007, doctors performed a surgery removing Dustin’s right arm, shoulder and some ribs. He received multiple phone calls, text messages and gifts from the friends he had made in the Cubs organization, including his favorite, Ryan Theriot. He continued to receive treatments after the surgery until February of 2008. Tests showed that the cancer had metastasized to his lungs. Dustin was then involved in several clinical trials, including treatments at different Universities and hospitals. In May of 2008, between treatments, Dustin took a trip with two of his best friends to Las Vegas and California. They had a wonderful time and it was a much needed vacation for Dustin. Towards the end of June, 2008, it was discovered that all of the treatments were unsuccessful. Dustin entered Hospice on July 3, 2008. He spent his last couple of weeks in his home surrounded by the unconditional love of his family and friends. Dustin had the unique opportunity to tell his loved ones good-bye, give advice, and reminisce on all of the wonderful memories he shared with them. Dustin passed away on July 16, with his loving family at his side. Dustin’s life, although short, made an impact on so many people; he was an inspiration to children and adults of all ages and is missed everyday by those who loved him.